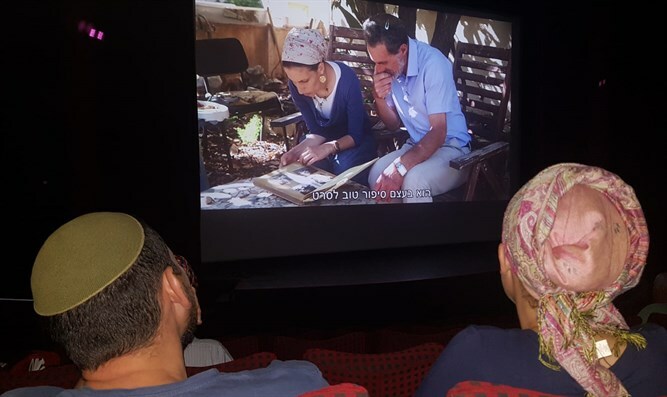 The film "Ruach Acheret," (“A Different Spirit”) directed by Menorah Hazani, tells the story of the Gush Emunim movement in its struggle for the renewal of the Jewish settlement in Hevron and the renewal of Jewish settlements in Judea and Samaria. The film was screened at the Tel Aviv Cinematheque, as part of the “Israeli Women Filmmakers Week” held at the Cinematheque. The film, which was screened for the first time at the festival, was viewed by residents of Judea and Samaria alongside those of Tel Aviv. At the end of the screening there was an open discussion with the director, during which the audience asked questions about the settlements and the film, some of which were answered by Hazani's father, Benny Katzover, on whom the film is based. In the near future, the film will be screened at cinematheques throughout the country, as well as abroad. One of the participants at the screening was Benny Ziffer, an Israeli writer, poet and journalist at Haaretz, who said: "I was in the leftist camp, and all I knew about the settlements, about Sebastia, about Kedumim, everything was from the negative side, everyone there was a monster. Suddenly, this movie changed my whole prism, suddenly I saw completely different things." "I think that this is a movie that must be seen. It needs to be shown, as they say, in the streets of Ashkelon, the streets of Tel Aviv, people will simply know things in a neutral way and not in the negative way we are accustomed to knowing them, and see the whole vision - which is basically a continuation of the ZIonist enterprise,” Ziffer added. Another viewer, Tali Ohayon, who is a screenwriter, director, producer, and member of the Directors Association, said: "I would like to warmly recommend Menorah Hazani's film about settlements, the burst into Judea and Samaria. Not only to supporters and those who love the settlements, but even to those who oppose them." The director and filmmaker, Menorah Hazani, summed up the event and said, "I am very moved, there is this part of meeting the audience and seeing the reactions, it's always so exciting, that's why I made the film and worked so hard on it - to reach the audience. The reactions, the warmth, the excitement of the audience gives me the strength to continue and really makes me happy. It's really fun to be creative at moments like this." She went on to describe her feelings about the screening of the film at the Tel Aviv Cinematheque. "I wanted to go to here. To Tel Aviv, to all the Land of Israel, not only to the settlements, not just to those who know me, but specifically to those who do not. I wanted to bring the settlements to Tel Aviv, to those who don’t know them, so that they will know them, meet them. I am very happy about this meeting, I really appreciate it. Thank you to the Cinematheque for hosting." "We hope there will be a series of screenings at cinematheques, as well as abroad," she added.